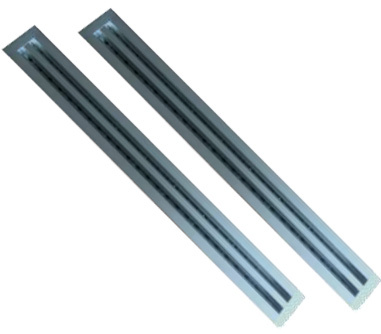 Iris is the CN ducted fan coil for heating and summer air conditioning, It is used in civil, industrial and commercial sectors. The convectors Iris allow CN to maintain a comfortable temperature in your conservatory with quiet operation and low power consumption thanks to the medium-temperature operation. The strength of IRIS CN is the reduced thickness, only 275 mm, achieved by careful planning architectural integration of convectors in environment. It 'available in 3 sizes with various powers. 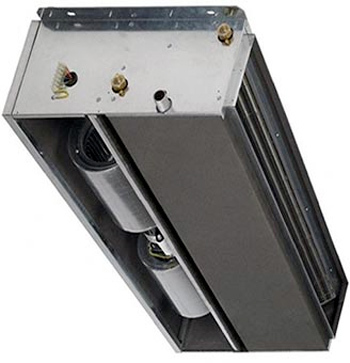 The fan coil IRIS CN is installed on the ceiling and then connected to the system via duct system. 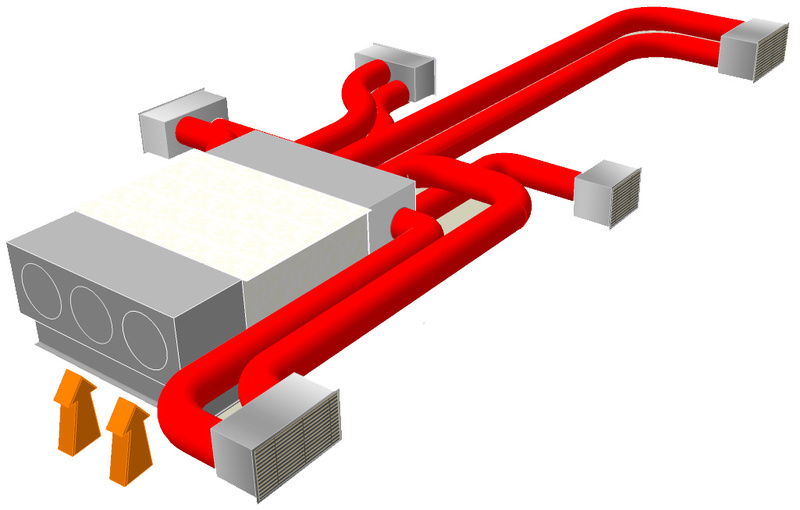 E 'consists of a water battery that exchanges heat with the ambient air entry into the internal fan, the air is cooled in summer and heated in winter. During the cooling operation, the air is also dehumidified: the moisture retained condenses and collects in the tank. The brushless centrifugal fans in the IRIS CN are double suction units with aluminum fans that guarantee high air flows and high static pressures. The brushless motor of the latest generation, permanent magnet, direct current varies from the 0 100% of the air flow and consequently the thermal power and cooling, adjusting fans to the actual needs of the room to be conditioned. 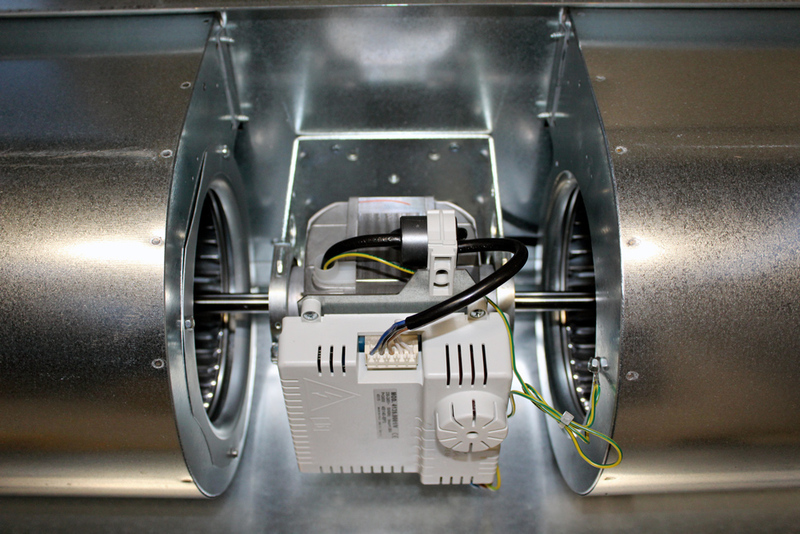 The fans brushless allow for quick set up of the rooms to be air conditioned with quiet operation. IRIS PACK is the air conditioning system for apartments up to 150 square meters and small commercial units. In combination with a heat pump, it guarantees both heating and summer conditioning. 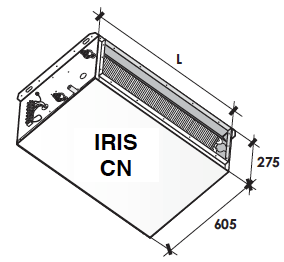 IRIS PACK is a package built around the IRIS CN 800 convector and contains all the components for the realization of a turnkey system: plenum, channels, outlets and fixing accessories. 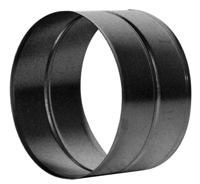 Bearing structure in extra thick resistant to rust, corrosion, metal, chemicals, solvents, aliphatic alcohols. self-supporting and removable panels, with holes (slots) for fixing to the ceiling / wall formed directly on the cover case. 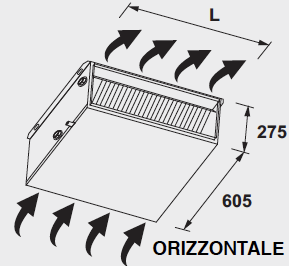 Pretranci and holes to configure the drive as required, for the installation of accessories available for the release of the water connections on the left and the right, for the reversibility of the unit at the installation site. Assembly with self-tapping screws for fast, complete and easy inspection / maintenance. Small size, optimized dimensions. Main casing consists of galvanized steel + internal thermal and acoustic insulation (class M1) of parts in contact with the battery. 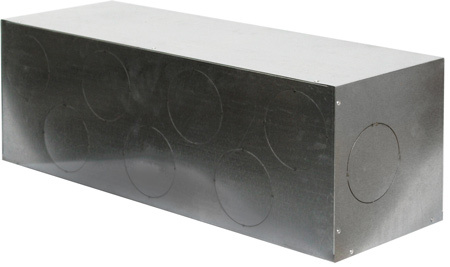 Auxiliary drain pan double angle for optimal evacuation of condensate, with drainpipe (standard on the same side of coil connections) + external thermal insulation (class M1). condensate pump equipped with 8 contact (250 V) Water flow: max 8 l / h (0 m ca); 6,5 l / h (1 m ca); 0 l / h (6 m ca). The standard unit comes standard with air filter top in acrylic polyester fabric with galvanized metal frame + 2 networks knitted galvanized (WAVY H100 - HIGH EFF. Grade EU5 filtration); 4 frame parts; removable filter from any direction. Battery of high-efficiency heat exchanger (Turbolenced Fins with a high n of Reynolds) made of copper pipes and aluminum fins fixed by mechanical expansion. Coil connections provided with anti torsion system, manual air vent valves, manual water drain valves. Standard right attacks: on request (no charge) connections on the left, in any case easily reversed on site. N ° 1 2 battery plant pipes. Coils tested at a pressure of 30 bar, suitable for operation with water up to the maximum pressure of 15 bar. The batteries are suitable for operation with hot water (pellet boiler), low temperature water (heat pump, radiant panels, condensing boiler, etc. ), Cold water (chillers and / or industrial processes), water added with glycol . 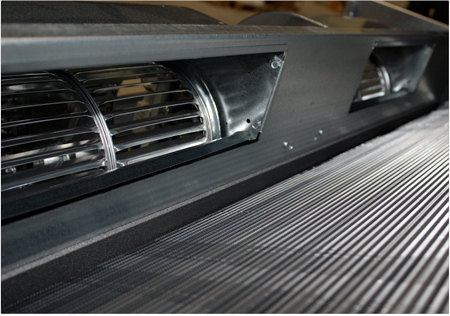 Sizes with 4 row coil (4R), normally used for cooling with treatment of the whole (or partial) outdoor fresh air, in cases where is required a high dehumidifying action. 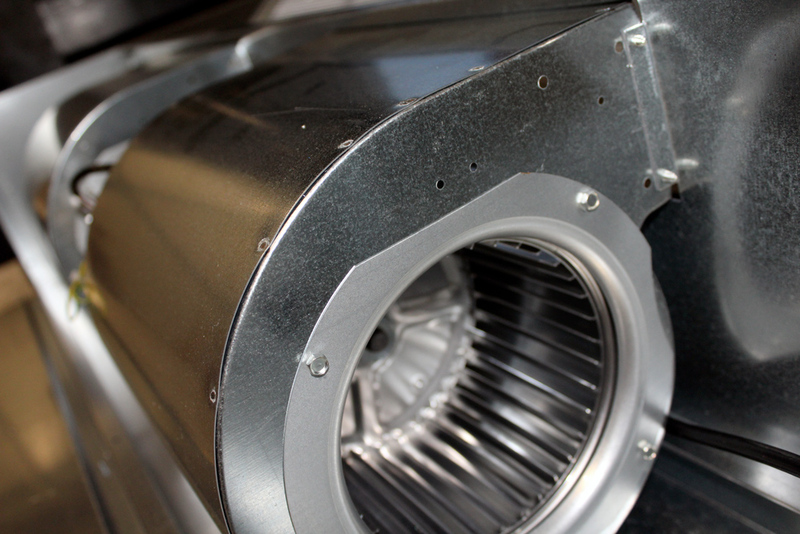 Each engine consists of a single fan directly coupled to its engine: Centrifugal fan with double air inlet aluminum impeller (forward curved fins). statically and dynamically balanced fan. 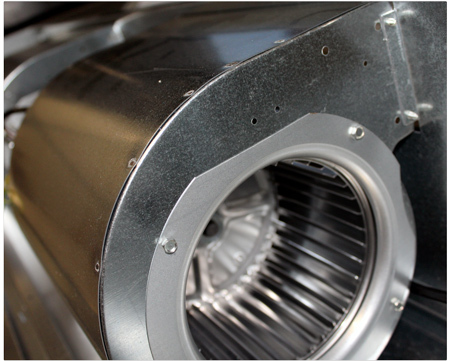 Extensive diameter fans (= high air flow and high static pressure) with low revolutions (= low noise level). Brushless motor: the latest generation of electronic motor, permanent magnet, brushless, DC. IP42, Class B, electric cables protected by double insulation. Mounted on elastic and anti vibration supports. • 50% annual savings in electricity compared to a traditional, 3-speed system (up to 70% when working at lower engine speeds). • 50% reduction of the noise level. 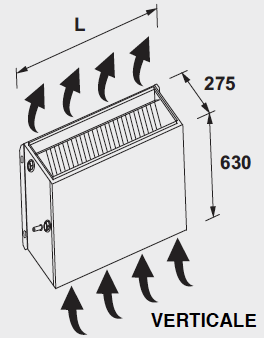 The silence is ensured by continuous variation of air flow, which allows the unit to operate at lower speeds. The brushless motor provides maximum power savings compared to all other currently available technologies. The Brushless complies with energy efficiency standards ErP Eup-2015. (1) (2) (3) (4) (5): Nominal technical data with free air flow (External Static Pressure ESP = 0 Pa). the continuous variation 0-100% of the air flow results in the consequent modulation of heat and cooling power, adapting them, moment by moment, to meet the actual needs in the room. speed and integrated operation amounted to approximately 50%, with the corresponding reduction of emissions CO2. IRIS PACK is the air conditioning system for apartments up to 150 square meters and small commercial units. In combination with a heat pump it guarantees both the heating that summer conditioning. 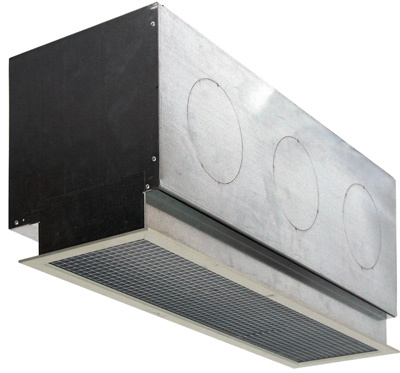 The heart of the system is the IRIS CN 800 horizontal false ceiling convector, to which are added all the components (plenum, channels, nozzles, etc.) for air distribution and diffusion. 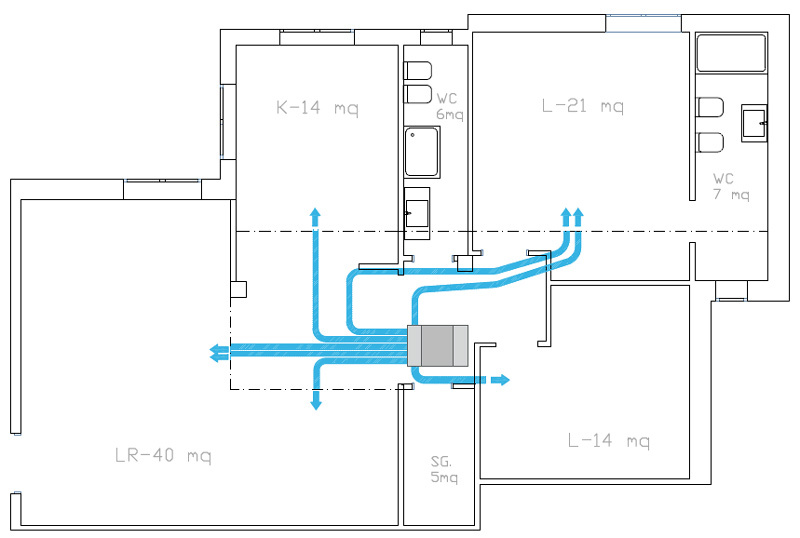 The air distribution network is easily created with circular ducts all of equal diameter, so that no expensive ducting is required. • Turnkey solution. 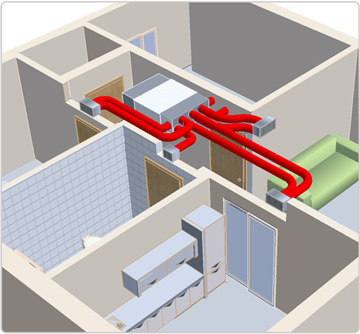 IRIS PACK is a complete system of systems: from the convector, to the ventilation ducts, to the air inlet and outlet vents. The package is complete with all the components necessary for correct installation. • Balanced system. 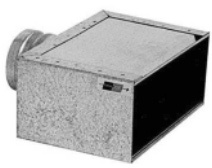 Thanks to the air distribution plenum designed specifically for IRIS CN 800, there are available up to 9 outputs for the air ducts. All the channels are characterized by an equal flow rate and very low pressure drops, making the system automatically balanced. In case of need, it is possible to intervene on the calibration dampers with all the outlets. • Quick and easy installation. IRIS PACK is installed quickly and easily. 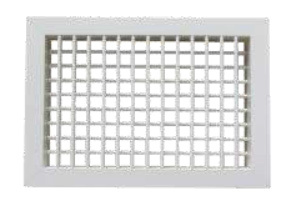 The air delivery ducts are connected on one side to the distribution plenum and on the other side to the intake vents. The fixing accessories that complete the system allow it to be installed properly. • Architectural integration. IRIS CN 800 with the reduced thickness of only 275 mm is housed in the false ceiling as well as the air ducts. 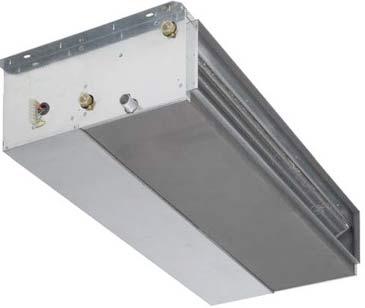 The plenum of recovery of the unit is of telescopic type so as to adapt itself to the height of the false ceiling. In this way the system is completely invisible. The air outlets are available in two versions, wall and ceiling, to satisfy every architectural requirement. • Comfort and silence. 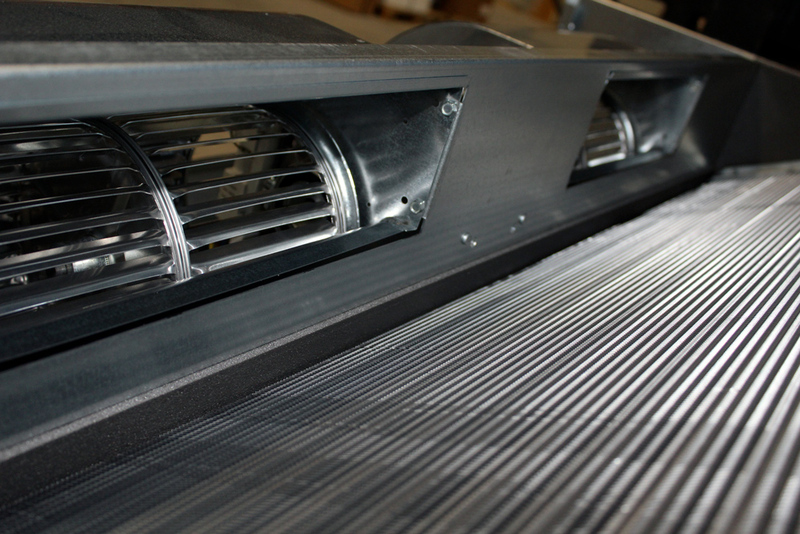 All components, from the channels to the vents, have been developed to work with low air speed. This makes every room quiet and comfortable without annoying air currents. 9 delivery plenum connections ∅ 125 mm. Telescopic intake plenum for connection to the 800x200 mm recovery grid. Semi-rigid pipe ∅ 127 mm. 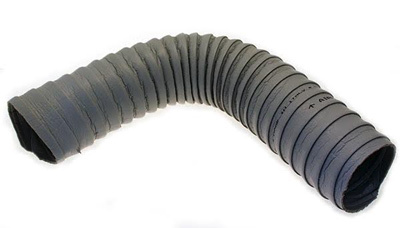 Sealed sleeve ∅ 125 mm for semi-rigid conduit connection to the discharge plenum. Linear sleeve ∅ 125 mm. 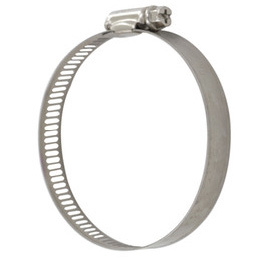 Fascietta steel pipe clamps ∅ 125 mm. 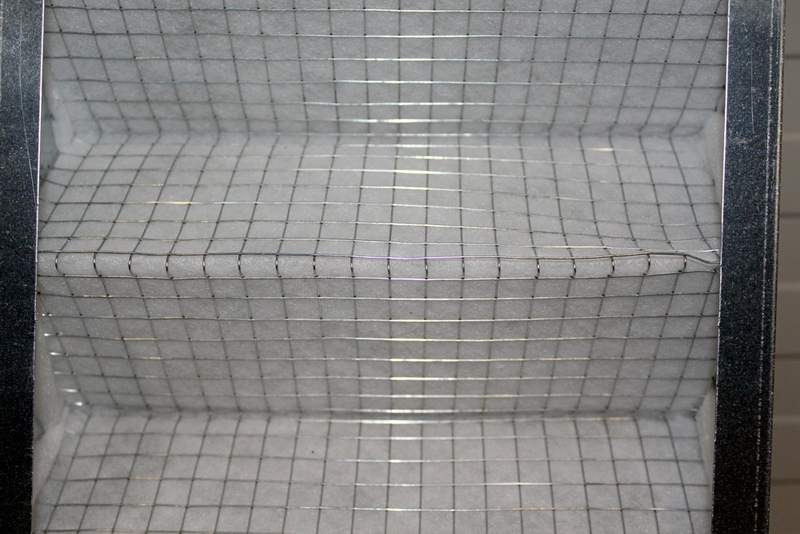 Calibration damper in galvanized sheet with opposing fins. 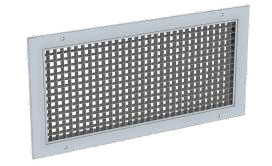 Plenum for intake grille, with lateral axial connections ∅ 125 mm. Square shooting grid 800x200 mm. Heating of a 110 square meter apartment. Ventilant and semi-rigid ducts housed in a technical false ceiling. Shooting on the ceiling under the car. The thermal requirement of the building is 9500 W corresponding to about 85 W / m2. From the consultation of the data in the 12 table (Iris Pack technical sheet) shows that this requirement is met with sizing at the average speed and feed temperature of 50 ° C. Depending on the environments to be served, all the front plenum outputs are used. 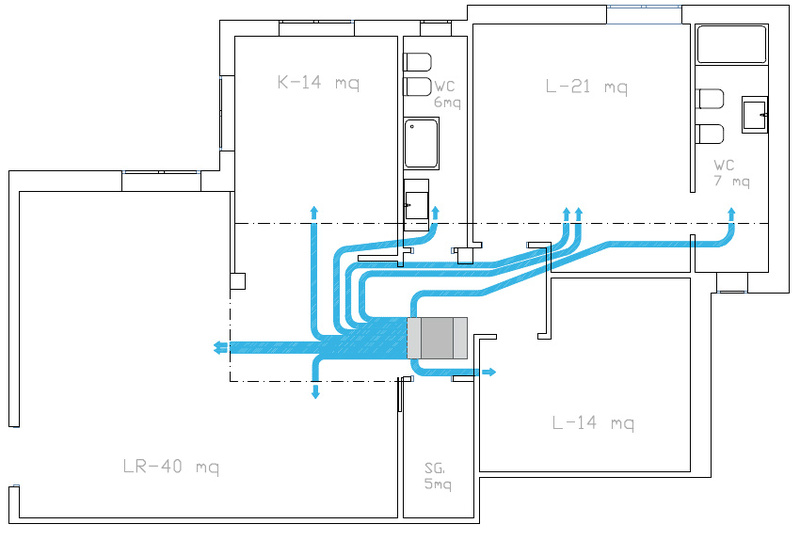 Conditioning of a 110 square meter apartment. Ventilant and semi-rigid ducts housed in a technical false ceiling. Shooting on the ceiling under the car. The refrigeration requirement of the building is 6300 W corresponding to about 70 W / m2 excluding bathrooms that are not treated. From the consultation of the data in the 12 table (look at the iris pack technical sheet) it is clear that this requirement is met with sizing at the average speed and water delivery temperature of 10 ° C. In this case it is sufficient to use only 7 connections to treat all the environments.